Under 8.1, I liked the "ME" app that put my avatar onto a tile on the Start menu and provided some Social networking functionality. I upgraded to Windows 10 Mobile, and the tile was missing. 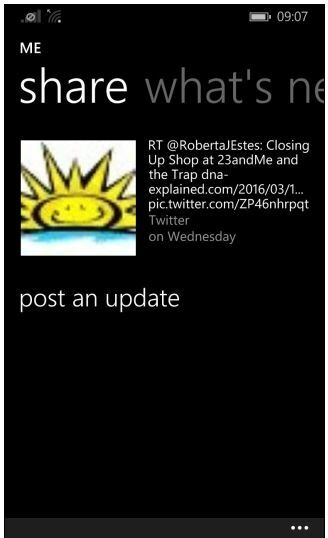 Was the ME app removed from Windows 10 Mobile, or is it still available somehow? Notifications for missed calls, messages and emails on contact tiles is not supported at the time of Windows 10 Mobile release. Certain enterprise features, including Data Protection Under Lock, are not available. Please contact your Microsoft Volume Licensing representative for more information. The Outlook Calendar app does not support Tasks. The MDM functionality to prevent saving and sharing Office documents is not supported. Not the answer you're looking for? Browse other questions tagged windows-10-mobile tiles or ask your own question. How to reset or rebuild Groove Music in Windows 10 Mobile?